Which Kills More People: Extreme Heat or Extreme Cold? Above: Left--a villager in Oy, Siberia endures temperatures of -41°C (-41.8°F) on November 27, 2018 (Mladen Antonov/AFP/Getty Images). 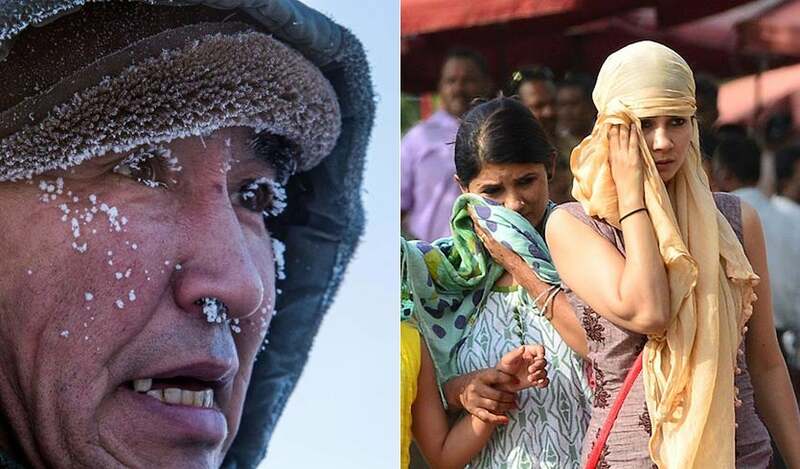 Right--residents of New Delhi endure record heat of 46°C (114.8°F) on May 2, 2016 (Ramesh Sharma/India Today Group/Getty Images). Extreme heat and extreme cold both kill hundreds of people each year in the U.S., but determining a death toll for each is a process subject to large errors. In fact, two major U.S. government agencies that track heat and cold deaths--NOAA and the CDC--differ sharply in their answer to the question of which is the bigger killer. One reasonable take on the literature is that extreme heat and extreme cold are both likely responsible for at least 1300 deaths per year in the U.S. In cities containing 1/3 of the U.S. population, a warming climate is expected to increase the number of extreme temperature deaths by 3900 – 9300 per year by 2090, at a cost of $60 - $140 billion per year. However, acclimatization or other adaptation efforts, such as increased use of air conditioning, may cut these numbers by more than one-half. Figure 1. 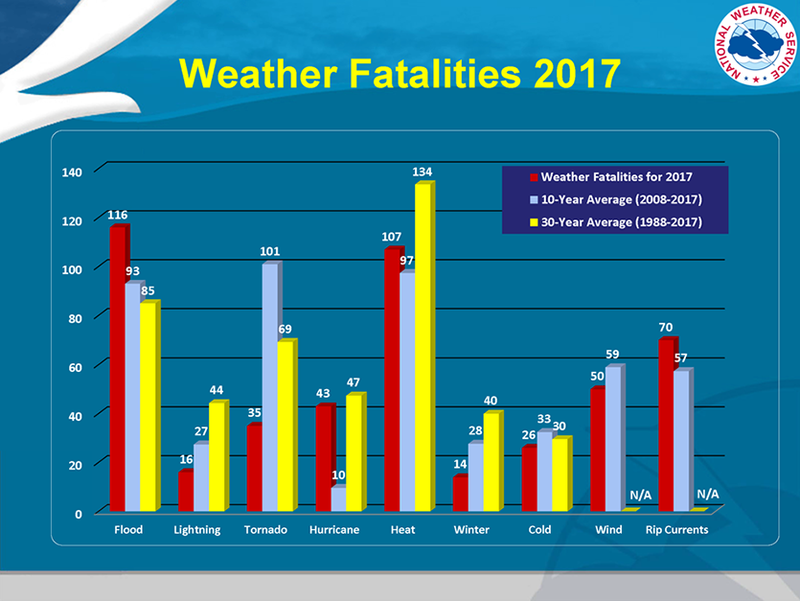 Weather-related deaths in the U.S. in 2017 (red bars), for the past 10 years (blue bars), and for the last 30 years (yellow bars), According to NOAA. Heat-related deaths dominate. NOAA’s official source of weather-related deaths, a monthly publication called Storm Data, is heavily skewed toward heat-related deaths. Over the 30-year period 1988 – 2017, NOAA classified an average of 134 deaths per year as being heat-related, and just 30 per year as cold-related—a more than a factor of four difference. According to a 2005 paper in the Bulletin of the American Meteorological Society, Heat Mortality Versus Cold Mortality: A Study of Conflicting Databases in the United States, Storm Data is often based on media reports, and tends to be biased towards media/public awareness of an event. In contrast, the CDC’s National Center for Health Statistics Compressed Mortality Database, which is based on death certificates, indicates the reverse—about twice as many people die of “excessive cold” conditions in a given year than of “excessive heat.” According to a 2014 study by the CDC, approximately 1,300 deaths per year from 2006 to 2010 were coded as resulting from extreme cold exposure, and 670 deaths per year from extreme heat. However, both of these numbers are likely to be underestimated. According to the 2016 study, The Impacts of Climate Change on Human Health in the United States, “It is generally accepted that direct attribution underestimates the number of people who die from temperature extremes.” For example, during the 1995 Chicago heat wave, only 465 death certificates had heat as a contributing cause, while excess mortality figures showed that close to 700 people died as a result of the heat (Figure 2). Figure 2. The relationship between high temperatures and deaths observed during the 1995 Chicago heat wave. 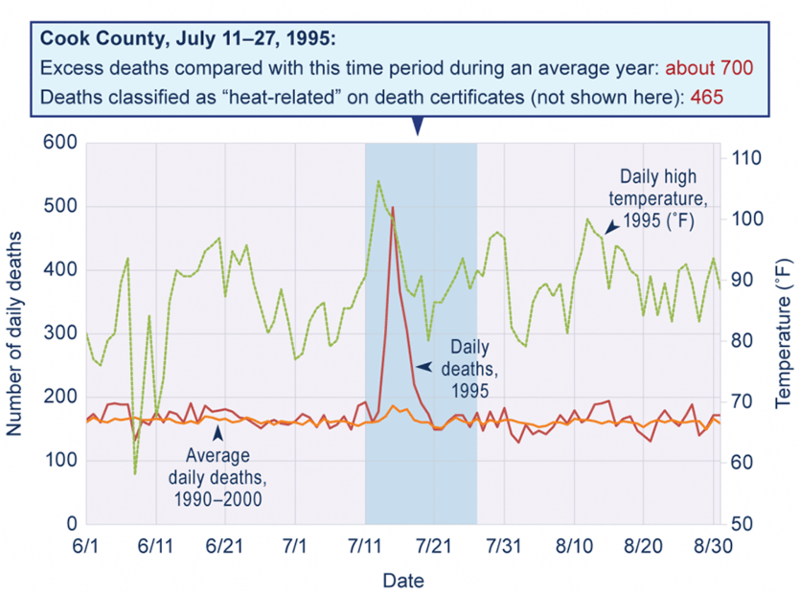 The large spike in deaths in mid-July of 1995 (red line) is much higher than the average number of deaths during that time of year (orange line), as well as the death rate before and after the heat wave. This increase in the rate of deaths occurred during and after the heat wave, as shown here by temperatures exceeding 100°F during the day (green line). 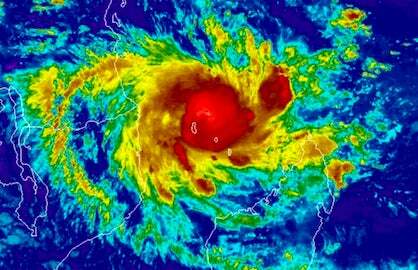 Humidity and high nighttime temperatures were also key contributing factors to this increase in deaths. The number of excess deaths has been estimated to be about 700 based on statistical methods, but only 465 deaths in Cook County were classified as “heat-related” on death certificates during this same period, demonstrating the tendency of direct attribution to undercount total heat-related deaths. Image credit: U.S. EPA, 2012: Climate Change Indicators in the United States, 2nd Edition. 84 pp. 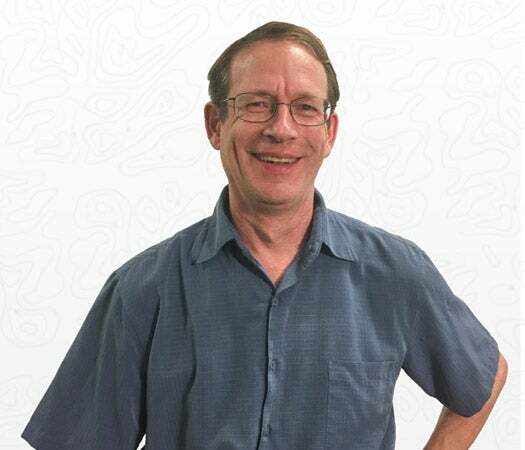 In a 2014 interview in the Washington Post of University of Miami climatologist Larry Kalkstein, who has published numerous research papers on weather-related mortality, weighed in on the matter: “Comparing apples to apples, which would be to evaluate acute or short-term responses to weather, I would always give the nod to heat-related deaths. However, if you are considering the seasonal differences in daily mortality, rather than just the “spikes” that we find with acute deaths, I can see why one can argue that winter (or cold-related) mortality is greater.” That was certainly the conclusion of a 2015 epidemiological study of deaths in 13 countries in The Lancet, which found that cold-related deaths in the U.S. were about a factor of fifteen higher than heat-related deaths. Cold deaths outnumbered heat deaths by a factor of twenty when averaged over all 13 countries studied. However, this study did not control for the seasonal cycle in death rates; deaths are always higher in winter, due to influenza and other non-weather-related factors. A 2011 study using such statistical techniques, An evaluation of the progress in reducing heat-related human mortality in major U.S. cities, found that heat killed approximately 1300 per year in 40 major U.S. cities between 1975–2004. This is an underestimate, since the full population of the nation was not included. Despite the fact that the climate has warmed in the U.S. in recent decades (by 1.3°F to 1.9°F since 1895, with much of that increase occurring since 1970), the study found that the death rate due to heat has been decreasing, due to adaptation. Figure 3. The increased U.S. annual economic damages from climate change in 2090, assuming a business-as-usual approach (a scenario called RCP8.5). 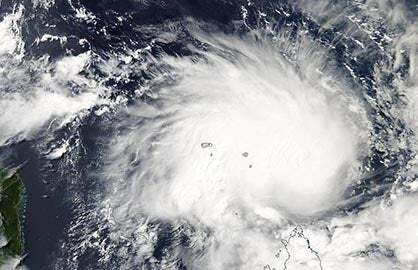 Sectors with estimated damages larger than $5 billion per year are labeled, and include the percent decrease in damages if moderately aggressive efforts to control greenhouse emissions are adopted (a scenario called RCP4.5). Sectors with less than $5 billion annual damages in 2090 under RCP8.5 are noted with asterisks, with no damage estimates given. Increased damages due to higher extreme heat mortality ($140 billion per year) are predicted to be second only to the $160 billion in annual damages due to lost wages due to a 1.9 billion lost labor hours, especially for outdoor industries whose workers are exposed to the elements. 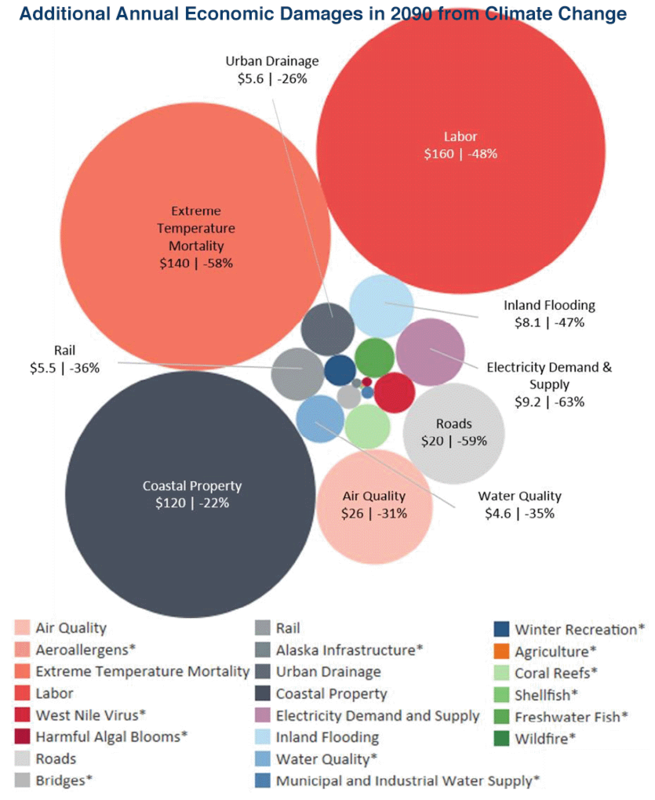 Image credit: EPA, 2017, “Multi-Model Framework for Quantitative Sectoral Impacts Analysis: A Technical Report for the Fourth National Climate Assessment”. The Fourth National Climate Assessment, released in 2018 on the day after Thanksgiving by the Trump Administration, found that under a business-as-usual approach to climate change (a scenario called RCP8.5, the path we are currently on), we should expect a large increase in U.S. extreme temperature deaths. In 49 large U.S. cities representing one-third of the nation’s population, the study projected that changes in extreme hot and extreme cold temperatures would result in 9300 additional premature deaths per year by 2090, at a cost of $140 billion per year (in 2015 dollars). 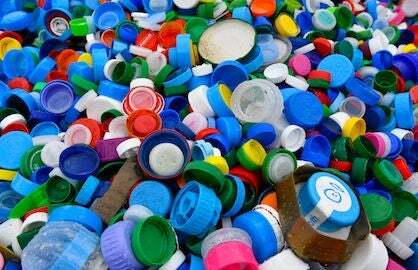 Since the study only covered one-third of the nation’s population, these are likely underestimates. The study did take into account the reduction in extreme cold deaths expected in a warmer climate; approximately 100 fewer cold deaths per year were expected by 2050, with no further reduction in cold deaths between 2050 and 2090. As discussed in the 2015 study in The Lancet, the great majority of cold-related deaths occur in moderately cold conditions, so a reduction in extreme cold due to global warming is not expected to cause a large reduction in cold-related deaths. The number of future extreme temperature deaths is likely to be lower than these estimates, though, when considering acclimatization or other adaptations (for example, increased use of air conditioning). The study estimated that extreme temperature deaths might be reduced by more than a factor of two, from 9300 per year to 4300 per year, from acclimatization or other adaptation efforts. However, the toll would be higher when considering the synergistic effect between extreme heat and increased ozone air pollution that is likely in a hotter climate. If moderately aggressive efforts to control greenhouse emissions are adopted (a scenario called RCP4.5), more than half of projected deaths could be avoided each year, down to 3900, at a savings of $80 billion per year. Related post: Flu Weather: It's Not the Cold, It's the Humidity by Bob Henson, Feb. 2018.